Spot Opportunities (Commercial Blog): Join Philips for a day of training, food & prizes! 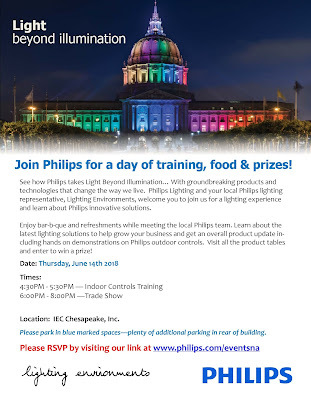 Join Philips for a day of training, food & prizes! See how Philips takes Light Beyond Illumination… With groundbreaking products and technologies that change the way we live. Philips Lighting and your local Philips lighting representative, Lighting Environments, welcome you to join us for a lighting experience and learn about Philips innovative solutions. Enjoy bar-b-que and refreshments while meeting the local Philips team. Learn about the latest lighting solutions to help grow your business and get an overall product update in-cluding hands on demonstrations on Philips outdoor controls. Visit all the product tables and enter to win a prize! If it's not too much trouble let me know in case you're searching for an author for your blog.You have some better than average posts and I figure I would be a decent resource. On the off chance that you ever need to take a portion of the heap off, I'd love to keep in touch with some material for your blog in return for a connection back to mine. It would be ideal if you give me an email if intrigued. Respects!